Borrowers retain the title to their home. One of the biggest myths surrounding reverse mortgages has to do with the mistaken belief that HECM borrowers lose the title to their home. This is not true. Reverse mortgage borrowers retain the title to their home. Upon the death of the last HECM borrower or if the borrower chooses to sell the home, the borrower (or his estate) merely needs to pay off the existing loan balance. Any remaining equity belongs to the borrower and/or their estate. Eliminate Monthly Mortgage Payments: Perhaps the single most important benefit is the ability of a reverse mortgage borrower to eliminate monthly mortgage payments. To illustrate just how impactful eliminating a monthly mortgage payment can be, I want to tell you the story of an 81 year old woman from Oceanside that called me about 4 months ago. She had no family or friends and her monthly income consisted of $1800 a month which she received from social security and a small pension. Her house payment was $1,100 a month (not including taxes and insurance). She had a car payment of $350 a month. How did she survive? By subsidizing from her savings. When she called me she only had $2,500 left to her name. She told me that she was using $700 a month from her savings to cover her bills and pay for food and such. At a $700 a month burn rate she only had 3 months left before she was out of reserves. A reverse mortgage allowed this 81 years old woman to stay in her home and begin living the quality of life she deserved. Live in the home for as long as you live: Another incredible benefit of the HECM program is that borrowers are allowed to live in the house for as long as they live. Provided the borrower keeps up with property tax, insurance, HOA and other property upkeep charges, the borrower is free to live in the home, for the rest of their lives. Even if they live to be 120 years old! As I mentioned, borrowers need to keep up with property tax, insurance, HOA and other property charges. Also if the borrower ceases to live in the home as a primary residence consecutively for more than one year, the note can be called due. 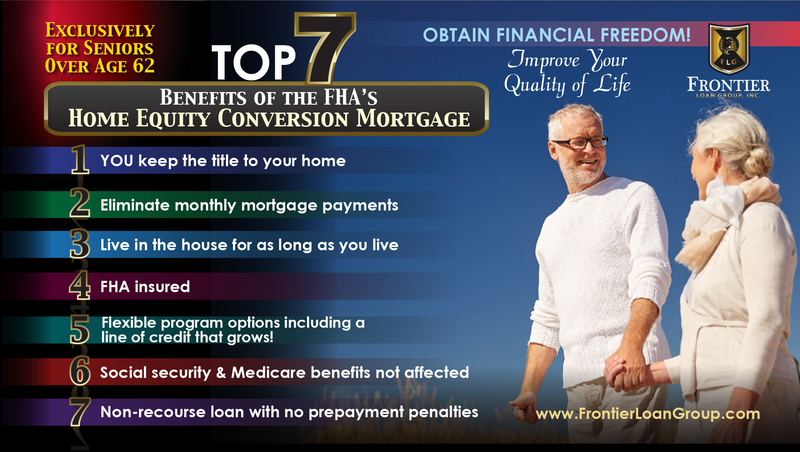 FHA Insured: The Federal Housing Administration (“FHA”) insures the HECM program. This insurance provides borrowers peace of mind that the investor on the note will comply with all of the terms and conditions of the HECM note. The FHA insurance also protects the line of credit from being reduced or frozen. Flexible Line of Credit of that grows: One of the most amazing features of the reverse mortgage program is the ability for seniors to establish a line of credit that grows. The line of credit grows by the interest rate plus the years FHA insurance premium every year. The growth only occurs on the unused portions of the line of credit. The FHA insurance provides borrowers peace of mind that their line of credit cannot be reduced or frozen. Non-Recourse Loan with No Prepayment Penalties: A reverse mortgage is considered a non-recourse loan, meaning that the only recourse the lender has is against the house itself, not the borrower or the borrower’s estate. Additionally, reverse mortgages do not have prepayment penalties so a reverse mortgage borrower could sell or refinance their home at any time without incurring any additional fees. Michael Gaddis, J.D. assists seniors and their family with their reverse mortgage needs throughout the State of California. For more information on Michael Gaddis, J.D. or FLG please visit www.FrontierLoanGroup.com or contact Michael Gaddis, J.D. directly at 760-692-5950 or by email at Michael@FrontierLoanGroup.com. FLG’s headquarters are located at 6104 Innovation Way, Carlsbad, CA 92009. Frontier Loan Group, Inc. is licensed by the California Bureau of Real Estate license#01449152 NMLS#345305 Michael Gaddis, J.D. is licensed by the California Bureau of Real Estate license #01433800 NMLS#280011. This entry was posted in Blog and tagged eliminate mortgage payment, HECM, hecm benefits, Home Equity Conversion Mortgage, line of credit that grows, no prepayment penalty, reverse mortgage, reverse mortgage guidelines, reverse mortgage medical, reverse mortgage medicare, reverse mortgage rules, top hecm benefits, top reverse mortgage benefits. Bookmark the permalink.